Our employees give back to N.C. communities. The NC Lottery is all about delivering joy across the state, but our fun games aren’t the only way we do that. With an enthusiasm to serve, employees across our six regional offices participate in service projects throughout the year. Led by the NC Lottery Volunteer Committee, we have been able to create and provide meaningful volunteer opportunities for the past few years, mirroring the heart organization and providing value to the state. Last year employees formed the first volunteer committee. 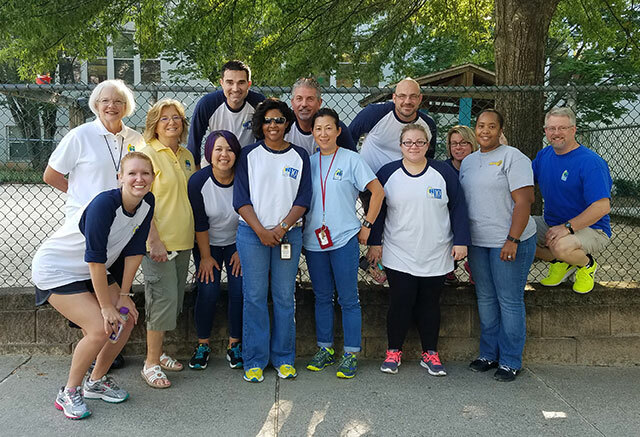 Since then, employees have participated in a school beautification project at Hunter Elementary in Raleigh, held a Red Cross Blood Drive, collected stockings for the Salvation Army, and held various book and food drives. IGT North Carolina, the lottery’s gaming system vendor, provides technology labs for underfunded counties around the state. The lottery helps to connect employees with nonprofits to fulfill volunteer needs by being a member of the Activate Good’s Corporate Volunteer Council.